Back in 1998 I had been the proud owner of the original PlayStation, however I was beginning to tire of it slightly. Many of my friends had instead opted for the more expensive Nintendo 64 and were having all sorts of fun with it. I realised I had been missing out. During the holidays that year I arranged with a friend to swap my PlayStation for his N64 during the summer break. One of the games that I jumped on to first was Forsaken and I instantly loved it. 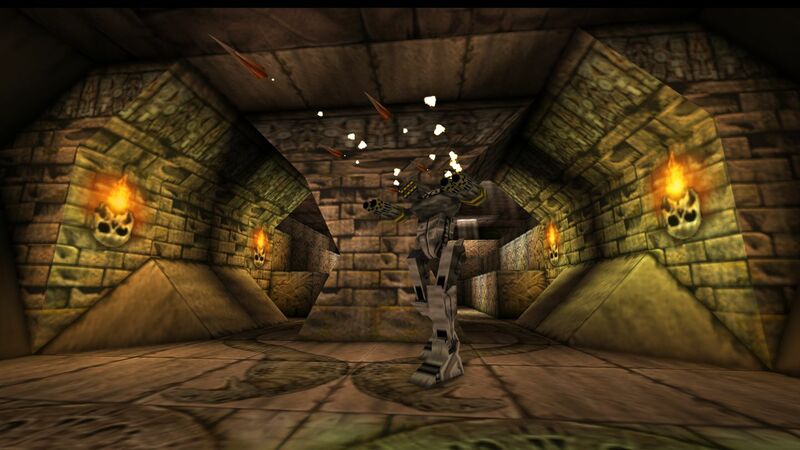 Now in 2018 – some 20 years later – Nightdive Studios have released a remastered version of Forsaken. So have they done justice to the original or is it a game best viewed through rose tinted spectacles? 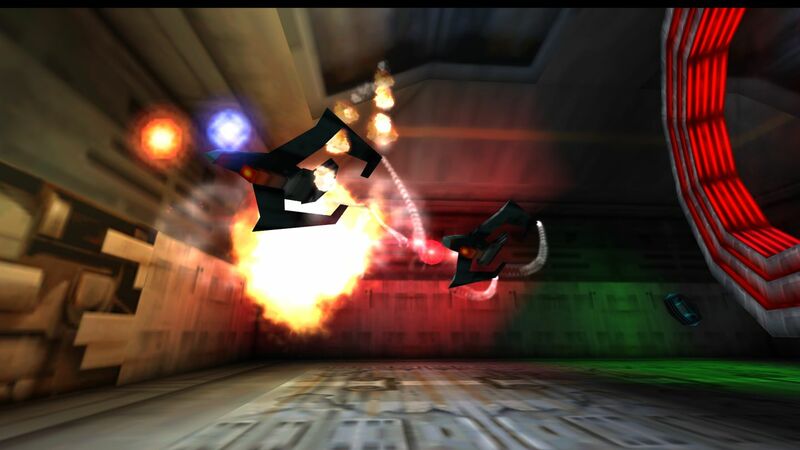 For those who never played the original, Forsaken is a first person shooter on hover bikes, giving you full 360 degree control over your vehicle. For its time this was a pretty big deal and presented players with a degree of control not really seen before. The game was divided up into fifteen levels, each presenting a greater challenge than the last, some were against the clock and others had huge boss fights at the end. Gameplay was fairly simple; you navigated the twisting corridors of each level shooting anything that moved or shot you back, all until you reached the goal. 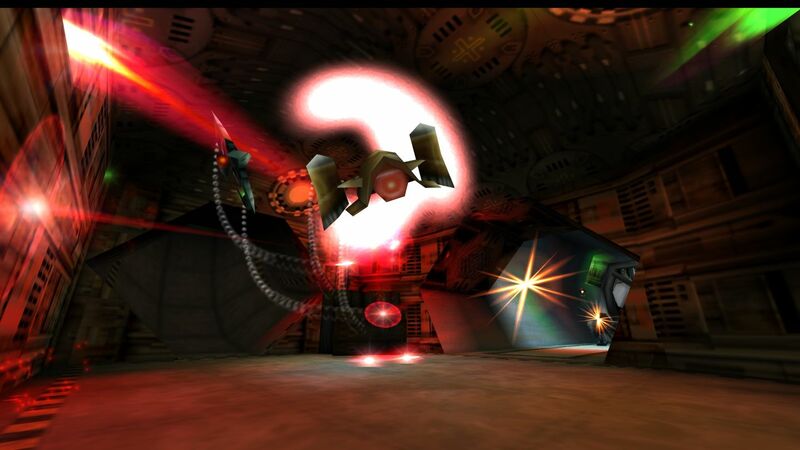 Originally the game actually came in a couple of varieties, the PlayStation version came with a full compliment of levels in single player and an excellent soundtrack, whilst the N64 version came in a mostly multiplayer package with some differences in graphics and sound, along with some slightly different levels that were exclusive to the platform at the time. This remaster comes on a whole new engine and combines all versions of the game into the ultimate package. Both single player and multiplayer are available in full along with the excellent soundtrack from the PlayStation original. Graphics have also been upgraded, textures slightly reworked and a much higher resolution gives the game a nice aesthetic that stays true to the original. Basically it comes across as how you remember the game looking – all too often these remasters just bump up the resolution and games tend to look worse than you remember them actually being. Thankfully the new engine here has worked well to bring a great presentation of the Forsaken as you remember it. Nightdive always stated they don’t do these remasters to upgrade the games; they want them to look the way you remember them and I can safely say they have absolutely achieved this here. Forsaken Remastered takes a somewhat unique take towards gameplay, with each level dropping you into a maze of tight corridors and open rooms full of enemies, with an aim of reaching the end of the level. You have the ability to fly around anywhere you can see and it’s this manoeuvrability that will become your greatest weapon, swinging around to dodge incoming fire and finding angles of attack that are unexpected. It’s certainly a refreshing way to play a first person shooter and it feels fluid with a stable 60fps throughout. You have two weapons at your disposal at all times, a primary and secondary that can vary based on pickups; from simple plasma cannons to rapid fire lasers and homing rockets, there’s a great array of weaponry to tackle any situation. Boss battles are a decent distraction here as the single player experience can get a little tiresome after a while. These are a great way to break up the monotony and bosses range from other characters on hover bikes that require some simple deft control to overcome, to others that use that typical ’90s trope of having a weak spot that needs to be attacked in order to defeat them. Some added variety here could have probably helped even more, but the fights do just enough to stop you getting bored. My only criticism here is that in 2018 the single player doesn’t stack up too well against modern games. It’s short and very repetitive, feeling like a game only fans would really enjoy as a single player title. Multiplayer however, is a whole different story, with staples like team deathmatch and capture the flag making an appearance. The package here is just as good as it was back in the day, throwing in support for up to 16 players and the previously platform exclusive maps. It’s hard not to recommend the package to anyone at this price. In fact, it offers up a really decently sized multiplayer package even when compared to most modern games. On top of this, with the added 360 degree movement it feels like something very different to most modern shooters. There does seem to be a few balancing issues however, particularly as some weapons seem to absolutely decimate your shields while others are like pea shooters in comparison. I imagine these issues were probably present in the original and hopefully the developer can look back and make some necessary changes in order to make this a more competitive package. My only issue so far is that the Forsaken Remastered isn’t particularly well populated in the multiplayer scene and so it can be a little hard to find matches. In a nice addition cheats from the original game still work here and add yet another layer of fun to proceedings. Staples from the ’90s, like “god mode” and “super beams”, are all available and can make tackling the single player an absolute cinch. A few others can have some hilarious effects but I would rather not ruin those here. It’s a nice little addition and one fans will certainly be pleased by. As far as any other issues go and there are a few that need to be addressed, especially in terms of the frame rate that while mostly locked to 60fps can occasionally get choppy in larger fights. I actually found this triggered some simulator sickness at which point I had to take a break rather than risk the second coming of my lunch. Thankfully this issue only pops up rarely. I also feel that Nightdive could have offered up a little more here, maybe some new maps or levels and the ability to toggle in some upgraded visuals would have gone a long way to making this a must have. As it stands though it’s a living recreation of the original in just about every detail… including any bugs or glitches. Overall though and Forsaken Remastered is a genuinely faithful recreation of the original, with just a little touch of smoothing over the visuals and the excellent addition of all previous content. This is easily the definitive package for fans, however for newcomers there won’t be much here to enjoy. See, this is 2018 and the single player will become repetitive quickly and the only saving grace is multiplayer, but I suspect any new players will have walked away before even trying out the decently sized multiplayer suite on offer here.